Did you know that sleep deprivation can cause the same level of impairment behind the wheel as intoxication? 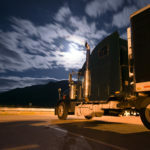 As a professional truck driver, your number one concern is safety, and sleep is an essential part of promoting safety on the roads. As you gain more experience, you’ll settle into a sleeping routine that works best for you. For the time being, consider trying the following tips. It can be tough to keep a regular schedule when you’re on the road, but try to keep your sleep and wake times as consistent as possible. This helps your brain regulate its natural sleep/wake rhythm. Remember that, according to the hours of service rules established by the Federal Motor Carrier Safety Administration (FMCSA), you’re required to take regular breaks for rest. Drivers are prohibited from driving more than 11 hours after getting 10 consecutive hours of rest. Park in a quiet location. You will typically park at a highway rest area or truck stop to get off the road. Some companies have facilities for truckers to use, and some customers set aside an area for truckers to park in overnight. Try to park in a quiet area, away from bright parking lot lights. The exception is if you’re in a cold region experiencing strong winds. In this case, you may be more comfortable if you park between two other big rigs. This minimizes the effects of the wind gusts hitting your trailer. Make your sleeper berth as comfortable as possible. You’ll sleep better if you’re comfortable. Add a mattress topper to your bunk, along with comfortable bedding and your favorite pillow. Reduce the amount of light in the bunk area as much as possible. If your alarm clock has illuminated numbers, dim it if possible or turn it around so that it faces away from your bunk. Bring earplugs on every trip, and consider plugging in a white noise machine. Are you ready to start an exciting new career as a big rig driver? Visit an open house event at Yuma Truck Driving School to get the inside scoop on the trucking industry. You can get in touch at (888) 647-3239.